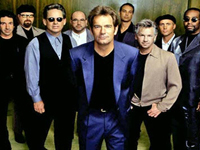 Huey Lewis & the News were a bar band that made good. With their simple, straightforward rock & roll, the San Francisco-based group became one of America’s most popular pop/rock bands of the mid-’80s. Inspired equally by British pub rock and ’60s R&B and rock & roll, the News had a driving, party-hearty spirit that made songs like “Workin’ for a Livin’,” “I Want a New Drug,” “The Heart of Rock & Roll,” “Hip to Be Square” and “The Power of Love” yuppie anthems. At their core, the group were a working band, and they knew how to target their audience, writing odes to 9-to-5 jobs and sports. As the decade progressed, the group smoothed out their sound to appeal to the aging baby boomers who adopted them, but by the beginning of the ’90s, the appeal of their formula had decreased. Nevertheless, the group remained a popular concert attraction, and they continued to have radio hits on adult contemporary stations. Upon their return to America, Lewis and Hopper began jamming at a Marin County bar called Uncle Charlies, which is where they formed American Express with Mario Cipollina (bass), Johnny Colla (saxophone, guitar) and Bill Gibson (drums), who had all played in Soundhole, one of Van Morrison’s backing bands in the late ’70s. American Express recorded a disco version of “Theme From Exodus,” calling it “Exodisco.” Mercury released the single, which was ignored. In 1980, the group added lead guitarist Chris Hayes and were offered a contract by Chrysalis who requested that the band change their name. The members chose Huey Lewis & the News and the band’s eponymous debut was released later that year to little attention. Picture This, the group’s second album, was released early in 1982 and the record became a hit on the strength of the Top Ten single “Do You Believe in Love,” which was written by former Clover producer Robert John “Mutt” Lange. A couple other minor hits, “Hope You Love Me Like You Say You Do” and “Workin’ for a Livin’” followed, and the band began building a strong following by touring heavily. Sports, the group’s third album, was released in the fall of 1983 and it slowly became a multi-platinum success, thanks to touring and a series of clever, funny videos that received heavy MTV airplay. “Heart and Soul” (number eight, 1983), “I Want a New Drug” (number six, 1984), “The Heart of Rock & Roll” (number six, 1984) and “If This Is It” (number six, 1984) all became Top Ten hits, and Sports climbed to number one in 1984; it would eventually sell over seven million copies. Late in 1984, Lewis sued Ray Parker, Jr., claiming that his song “Ghostbusters” plagiarized “I Want a New Drug.” The suit was settled out of court. The News had their first number one single in 1985 with “The Power of Love,” taken from the soundtrack to Back to the Future. Huey Lewis & the News returned with their fourth album, Fore!, in 1986. The record sailed to number one on the strength of five Top Ten singles: “Stuck With You” (number one, 1986), “Hip to Be Square” (number three, 1986), “Jacob’s Ladder” (number one, 1987), “I Know What I Like” (number nine, 1987), and “Doing It All for My Baby” (number six, 1987). The band was riding high on the charts when they decided to expand their musical reach with 1988′s Small World, dipping tentatively into various American roots musics. While the record produced the Top Ten hit “Perfect World,” it was a commercial disappointment after two chart-topping, multi-platinum albums, stalling at number 11 on the charts and only going platinum.